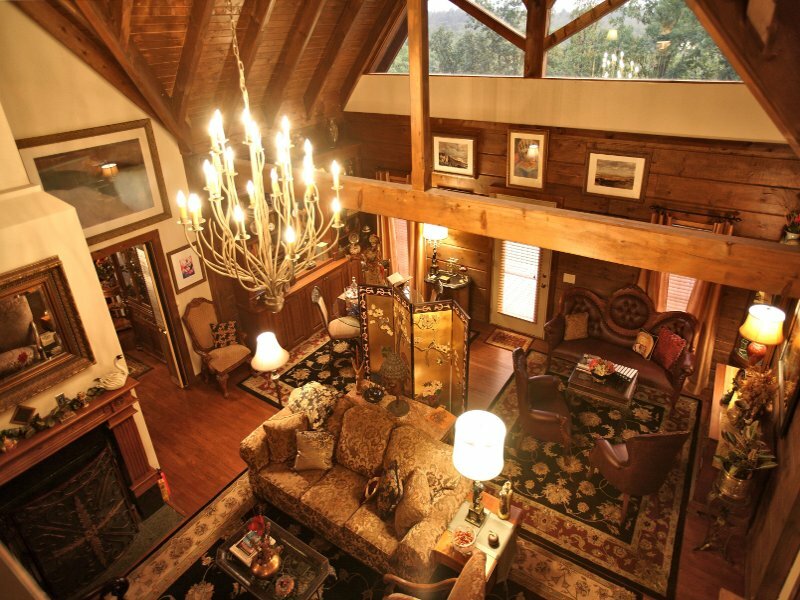 Our latest addition is a large log home called Beauty Lodge. 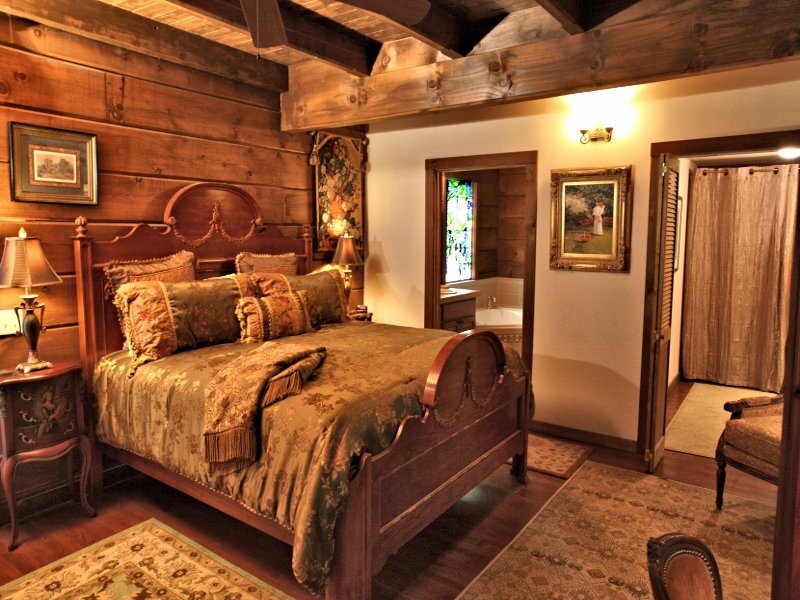 Perched on top of the hill, overlooking Azalea Falls hollow, it offers three luxurious bed and breakfast styled rooms. 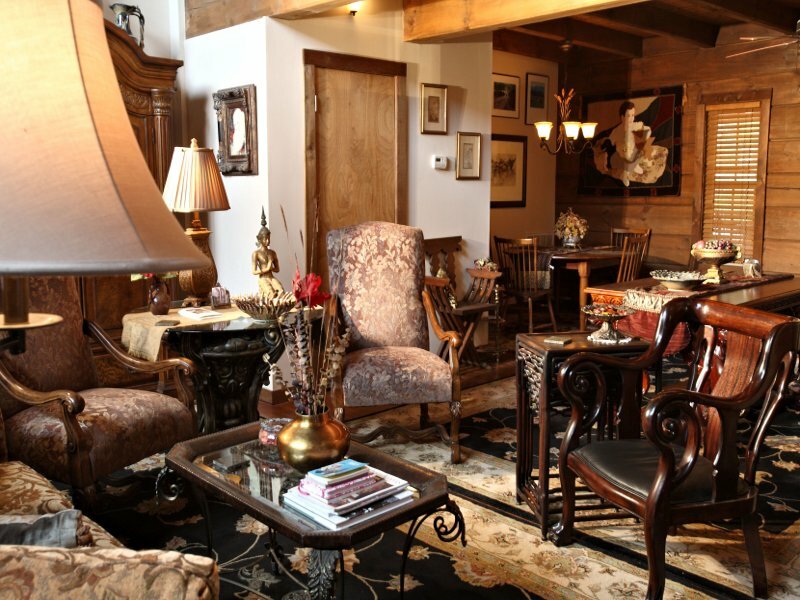 It resembles a gallery filled with artwork (much of it by local artists), beautiful antiques, and many other collectibles assembled over the years. 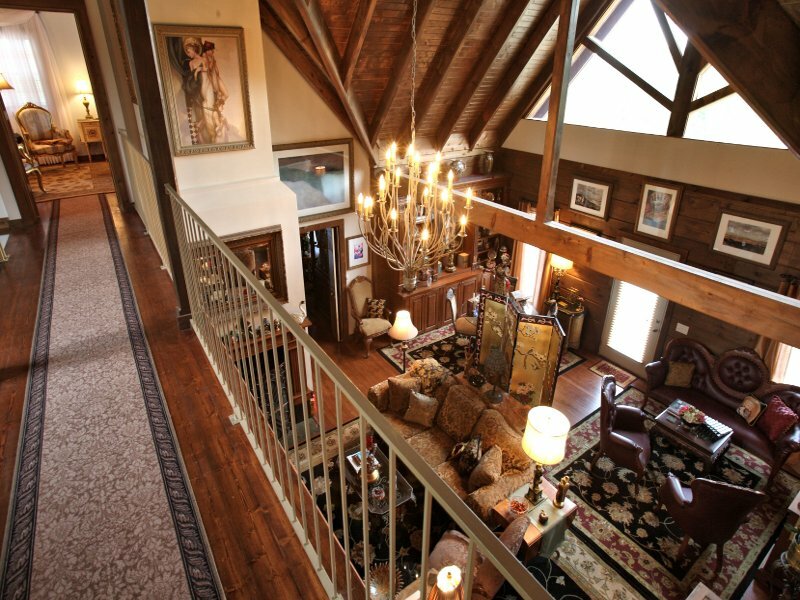 For this reason, this home is for adults only. Each room is equipped with a 32 inch flat screen TV, satellite service, DVD player, small refrigerator, microwave, coffee pot with coffee or tea selection, and whirlpool tub. 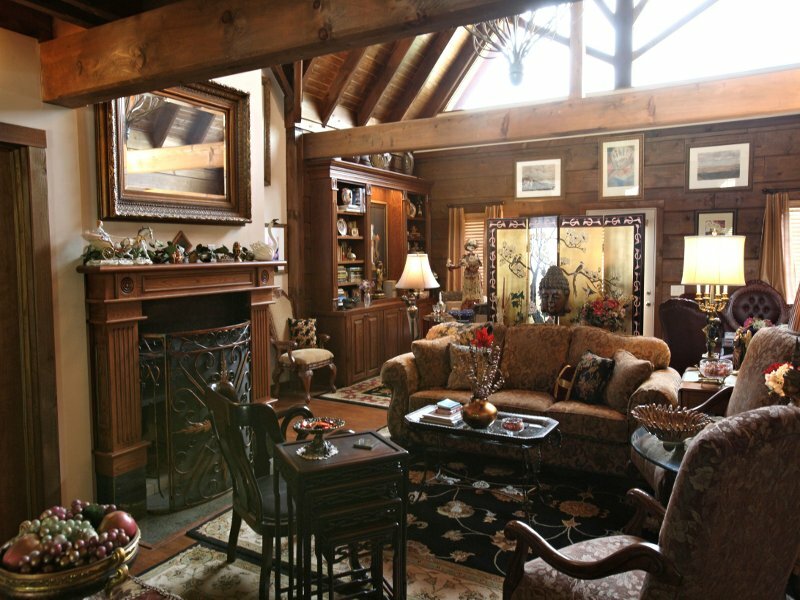 There is a large great room on the ground floor with a wood burning fireplace (in season) and another sitting area between the two upstairs bedrooms. 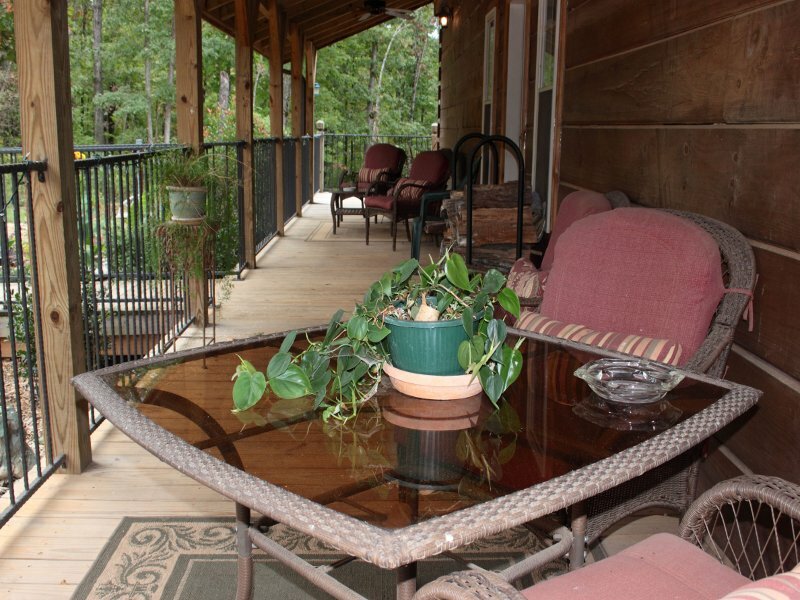 Encircled by a large wrap-around deck, the lodge offers plenty of comfortable furniture for enjoying the outdoors and the wildlife, along with a propane grill for the use of our guests. Motorcycle accessible. Rooms are priced either with or without a full breakfast. 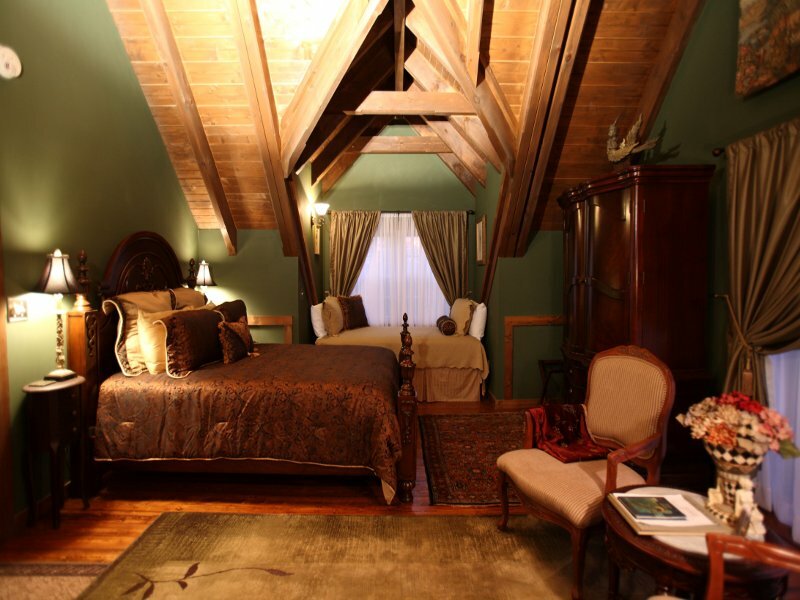 And, the three rooms may be rented in conjunction with the lodge and cabin for groups of up to 32 people. 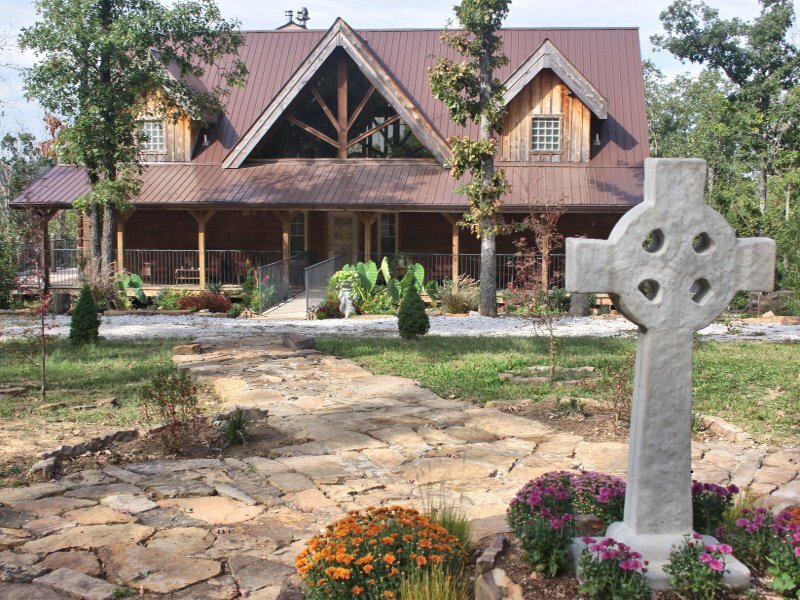 Day rates are available and off-site catering is also an option for an additional cost. 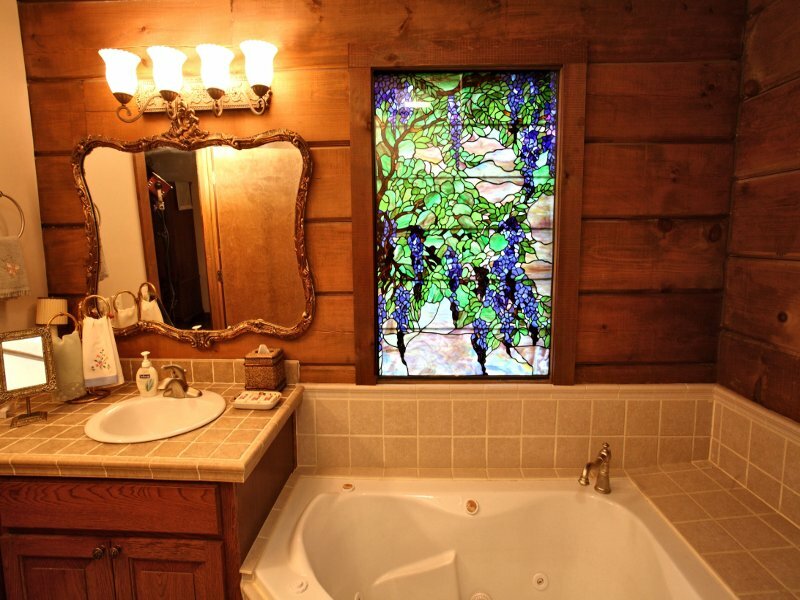 English Rose Room – Luxurious king bed, very large 2 person whirlpool tub with stained glass window, separate vanity area, ceiling fan, 32 inch flat screen TV, DVD player, small refrigerator, microwave, coffee pot with coffee and teas, private entrance to wrap-around deck area. Two adults only. Champagne and flowers may be added for an additional cost of $35 plus tax. 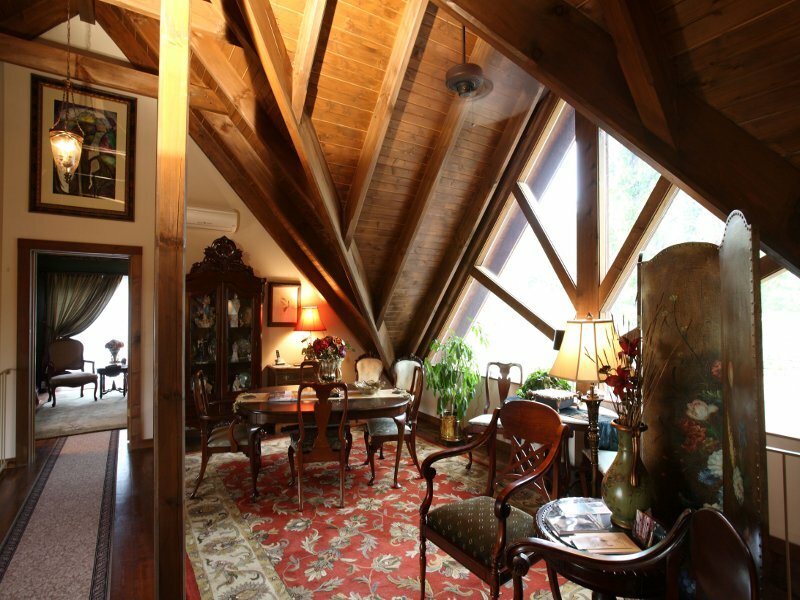 With full breakfast - $150 plus tax per night for 2 people. 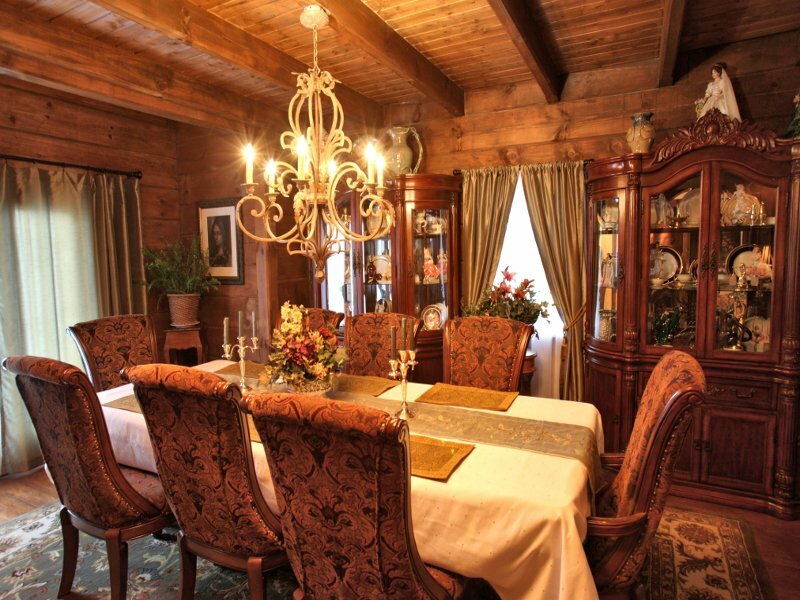 Without breakfast - $125 plus tax per night for 2 people. 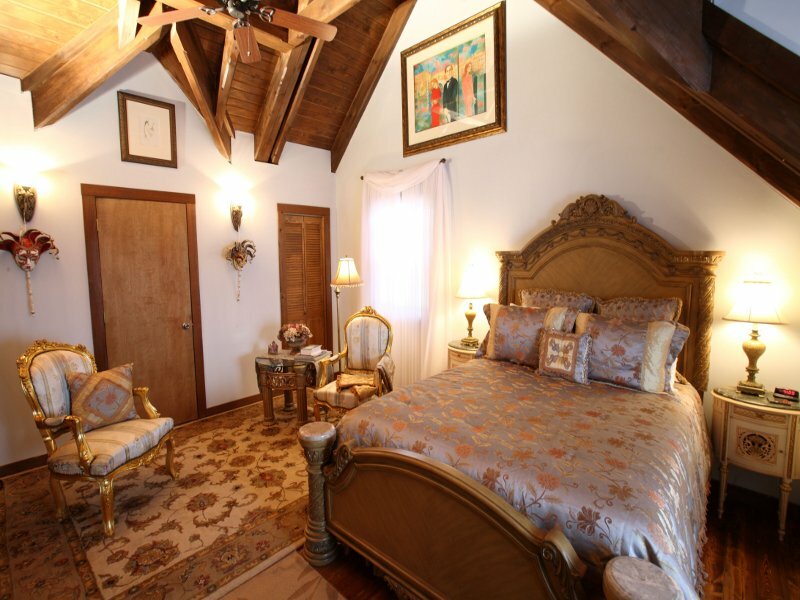 Secret Garden Room – Queen bed, twin bed in the dormer window, 2 person whirlpool tub, ceiling fan, 32 inch flat screen TV, DVD player, small refrigerator, microwave, coffee pot with coffee and teas, and private balcony. 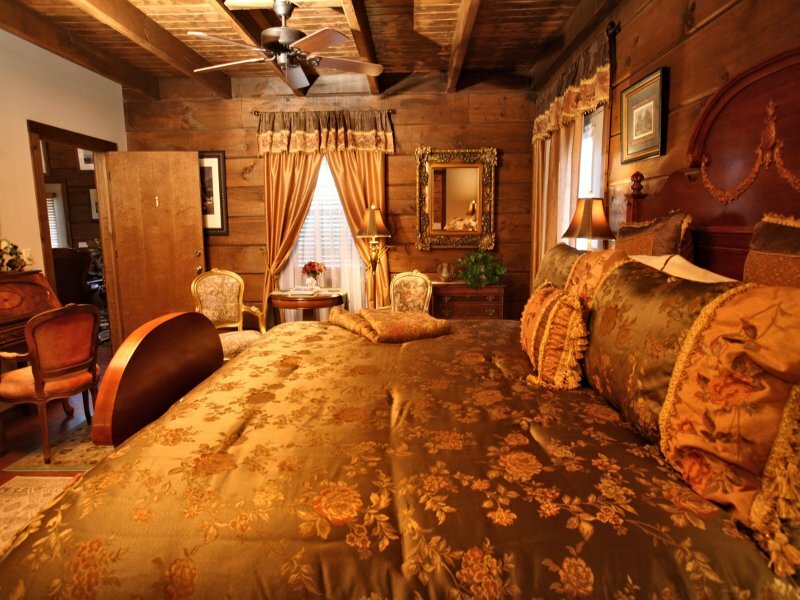 An additional person may stay for $20 plus tax per night. Champagne and flowers may be added for an additional cost of $35 plus tax. 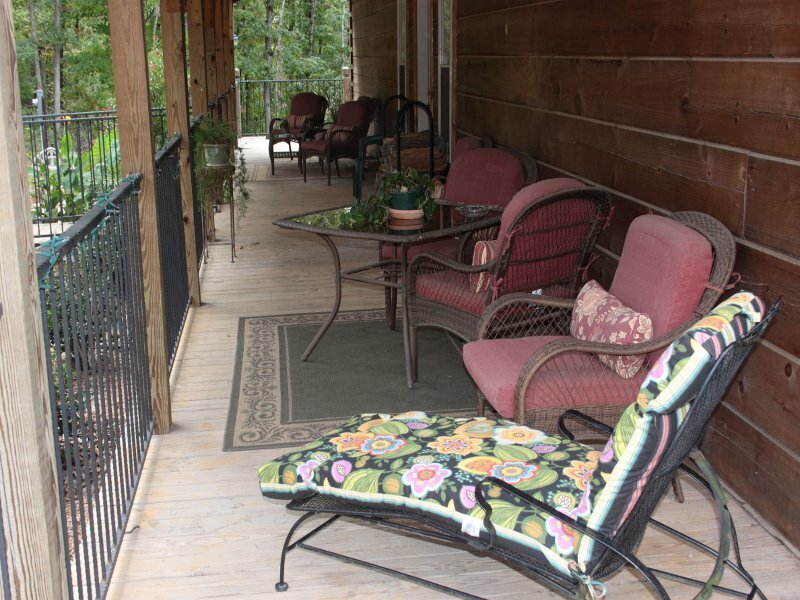 With full breakfast - $135 plus tax per night for 2 people. Without breakfast - $110 plus tax per night for 2 people. 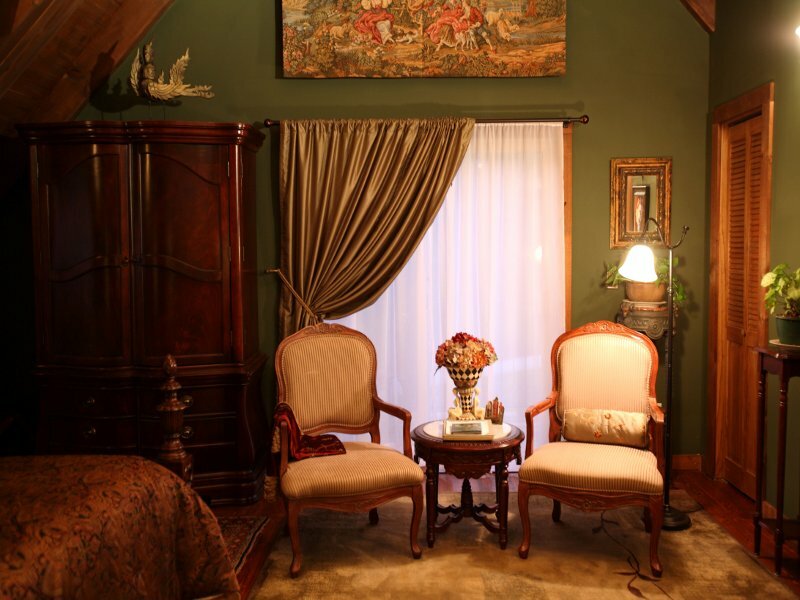 Venetian Room – Queen bed, twin bed in the dormer window, 1 person whirlpool tub, ceiling fan, 32 inch flat screen TV, DVD player, small refrigerator, microwave, coffee pot with coffee and teas. 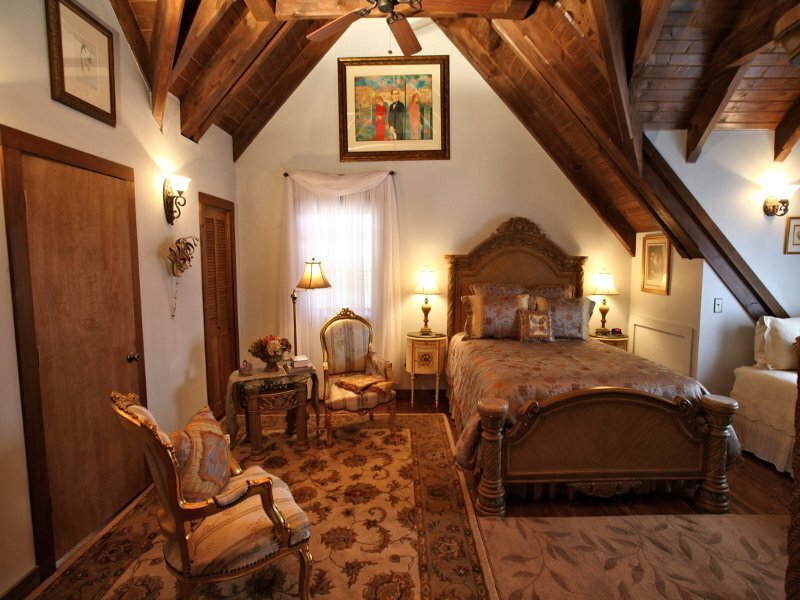 An additional person may stay for $20 plus tax per night. Champagne and flowers may be added for an additional cost of $35. 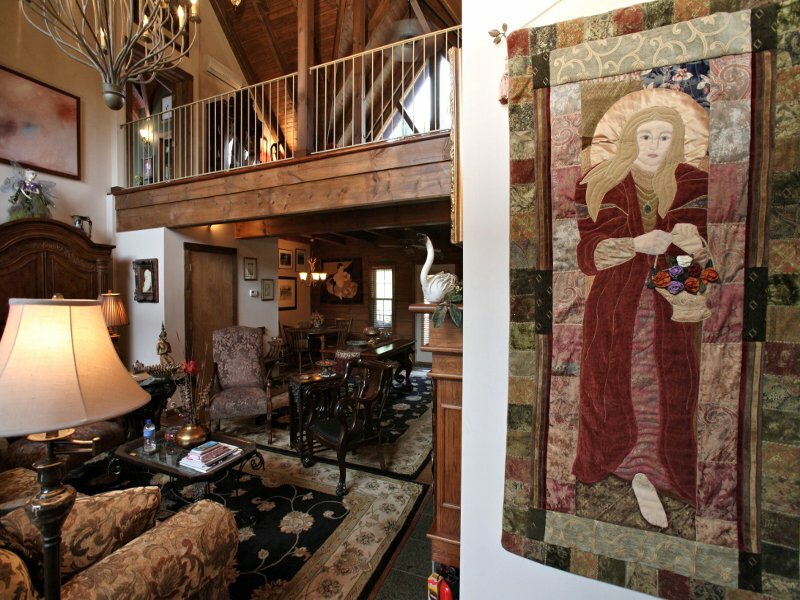 All three rooms may be rented in conjunction with the lodge and cabin, without breakfast, for $345 plus tax per night. Day rate (9:00am to 4:00pm) for up to 20 people is $400 plus tax. Off-site catering is available for additional cost. Beauty Lodge is motorcycle accessible. Call for reservations and availability. Email us and ask for our free brochure.